Welcome back to Audio Science class! Now that we’ve covered the basics, let’s get to those questions. Q: Why do I need to master my audiobook productions? A: Mastering is the the final step of post-production and the glue that brings the entire audiobook together. All chapters/sections are brought up to matching levels, which provides a smooth listening experience. Additionally, removing unwanted high and low frequencies can help reduce any hum or hiss that may be in a recording. Q: Why do I need to follow all of these mastering requirements? A: Audible offers each audiobook in a range of different audio formats to accommodate listeners on Audible, Amazon, and iTunes. This means that audio quality will range from very high fidelity to lesser fidelities that equate to smaller file sizes and quicker downloads. Basically, if your RMS is between -18dB and -23dB RMS, with peaks at -3dB, you’ll achieve the optimal sound across all formats. A: RMS has many functions, but for audiobooks it’s the value assigned to the overall volume level of an audio file. Audible will apply light dynamics processing once your audiobooks are submitted, so your production’s overall levels should not be too high or too low. For example, a production with a low RMS but loud peaks could end up with technical issues within the file, such as uneven narration levels, a high noise floor, etc. 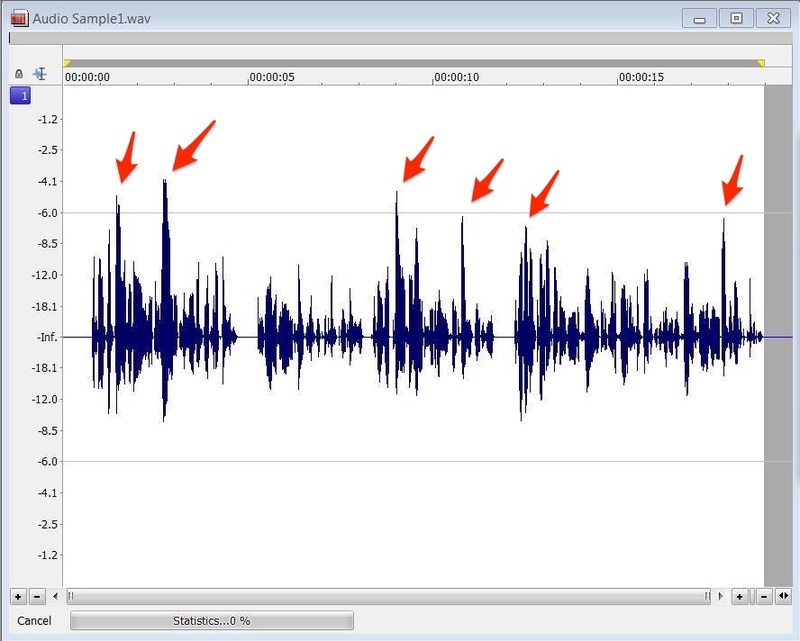 Examples of peaks in an audiobook recording. A: Peaks are the loudest part or parts of an audio file. If the script calls for a change from calm to excited, or from speaking to yelling, those excited or loud parts will most likely have the highest peaks. Our Audio Submission Requirements call for peaks to be under -3dB, which helps prevent distortion. If you have any 0dB peaks after mastering, you’ll need to adjust your limiter or normalizer settings and try again on your edited audio. If you have 0dB peaks before mastering, you’ll need to find out whether those peaks occurred during recording or after. If it happened during recording, you’ll need to lower your pre-amp’s level and re-record those lines of narration. Q: What is an EQ? A: An EQ (short for “equalizer”) is a tool that allows you to adjust the level of any frequency in an audio file. The typical frequency range that the human ear can detect is 20Hz to 20,000 kHz. The lower frequencies in this range are the bass/low range, while the middle is the mid-range, and high frequencies are the high range. Most EQ plug-ins will have high pass filter and a low pass filter. Using the high pass will remove any unwanted bass (low) frequencies that could have occurred during recording, such as the hum of your computer. A low pass will remove high frequency noises in your audio, like an air conditioner or microphone hiss. I strongly recommend applying EQ before you master, as unwanted high or low frequencies can have an impact on the next step in your mastering process – applying a limiter. Removing a low frequency hum allows the limiter to more easily adjust to the narration at hand. Q: What is a limiter? In this case, you can use a limiter to lower all peaks by -3dB. Your max peak level would now be -7dB, as illustrated below. Now that we’ve gone over mastering as a concept, I think you’re ready to take a look at my Mastering Breakdown. It’s a great checklist to mark off each time you master an audiobook. 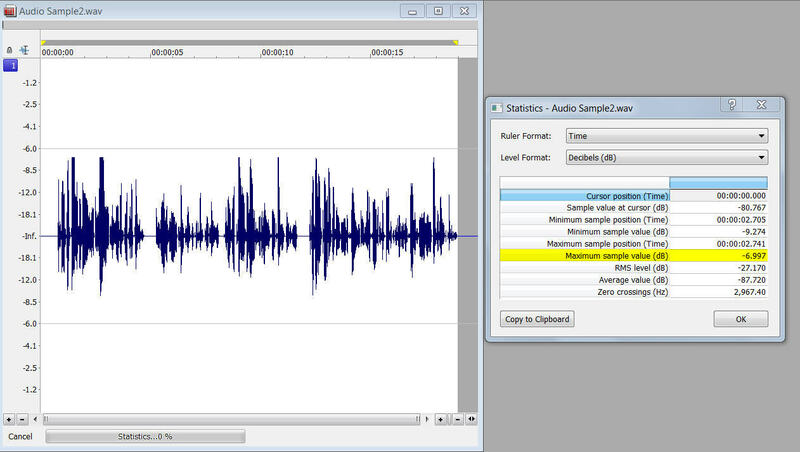 Assess all audio files to ensure no peaks or clipping exist in the audio. A good recording and careful editing are both necessary to achieve this. Group all similar files together during the assessment so they can be processed at the same time. Remove all unnecessary low and high frequencies by applying EQ to clean up the sound of your recordings and provide more headroom in order to boost your files levels effectively. This is a great way to minimize hum and hiss in an otherwise good recording! Bring all files up to the proper dynamic levels as specified by the ACX Audio Submission Requirements page by using normalization, compression and/or limiting, and, if necessary, a final volume adjustment. Listen to your audio after mastering to ensure the operation did not over-process or under-process the recordings. If the resultant audio is at one consistent volume with no change in dynamic level, you’ve likely over- If your audio has sudden spikes and drop offs (indicating it is too dynamic), you’ve under-processed. That wraps up today’s lesson. I hope you all have a stronger understanding of audiobook mastering than when we started. Mastering your productions can seem daunting and technical, but once you know which aspects of your voice and recording space need to be accounted for, you’ll be able to apply the same processes over and over again with minimal changes. You’ll take your audiobook productions from good to great, and your listeners will appreciate the subtle improvements in sound quality you’ve achieved. Want audiobook production tips in your inbox? Subscribe to The ACX Blog for the latest from Alex the Audio Scientist. This entry was posted in Actors + Studio Pros, Audio Scientist, Uncategorized and tagged ACX, audio scientist, Audiobook Creation Exchange, audiobook production, audiobook recording, audiobook voiceover, make audiobooks, mastering. Bookmark the permalink. Thank you, Alex. This is great. One question though: The DAW on display here is not ProTools. Within ProTools’ AudioSuite and using their Compressor/Limiter (which doesn’t have an outright option to lower peaks), I’m wondering what would be the best technique to lower peaks and compress the track without it becoming fuzzy. Also, there’s no option to “check statistics” within ProTools, so is there another application to ensure the most dynamic sound is reached within ACX’s perameters. When using their Compressor/Limiter plugin, it should only be used to help limit any major peaking that happened during the recording. Retaining the dynamics of the performance is key. When using the compressor, I would set the ratio at 1.5:1, an attack of 5-10ms, and a release of 110-120ms. On the left side of the plugin are Input/Output meters and a GR (Gain Reduction) meter. Go to the loudest part of your audio. Begin playback and slowly turn the threshold knob counter-clockwise away from 0db until you see about 1dB to 2.5 dB of gain reduction on the GR meter. After this, the decision of whether you need more or less reduction is something you need to decide by ear. This does take practice. A suggestion I have is to listen to your favorite audiobook productions of a similar genre to your current production and compare how the dynamics of the narration sounds compared to yours. To check peaks and RMS, modern versions of Pro Tools have the “Gain” plugin, which is under AudioSuite -> Other. Just make sure you have the entire region of audio selected when looking at the Peak/RMS meters in the plugin. Alex, I’ve uploaded a number of books successfully to ACX. I have since switched to camtasia studo to record because it’s a clearer program. Although I have followed all the uploading instructions from ACX I keep getting my mp3 files rejected. How do I upload a camtasia program into ACX without a problem? Hi Zackary, I notice no one has replied to you after six weeks or so. I don’t know what your specific solution is. However, if you’re in this for the long term, I recommend that you do not use Camtasia for audio recording. It’s audio tools are very, very primitive and will make you feel like you’re trying to do surgery while wearing boxing gloves. If you don’t want to (or can’t) invest in a pro DAW, download Audacity, free audio software with much more nuanced tools than Camtasia. Trying to produce ACX-ready files from Camtasia is possible, but you are paddling upstream against a strong current. From setting volume to exporting files, Camtasia is really meant for quick-n-dirty corporate presentations, and you have to dig very deep into obscure settings to achieve the pro-level audio that ACX requires. I am not against Camtasia — I use it at work — but my familiarity with it is why I would never try to hit ACX specs with it. Wishing you every success! Hey Alex, When ACX says all files must have an RMS between -18 and -23dB RMS, you mean as an average, right? Or are you saying that the entire dynamic range of the file can only be 5 decibels? Follow-up: elsewhere on ACX, they’ve posted examples of “Good files.” The good files do not fall between -23 and -18dB RMS. So I’d appreciate any clarity you can offer on what this requirement really means. (Files posted on http://www.acx.com/help/mastering/202008300; Good01 averages -26.78 according to Audition CC). Yes, as average. As long as your overall RMS per file is a value between -18dB to -23dB RMS (and meets all other ACX audio requirements), you will have no problem. About Adobe Audition, are you reading the Total RMS or Average RMS? For instance, if you read the RMS of the sample Good01 in Sound Forge via “Statistics” or the js:Audio Statistics plug-in in Reaper, it will come out at about -20.8dB RMS. The Total RMS reading in Audition should be the same or close to the one from Sound Forge and Reaper. Adobe uses their own algorithm for their Average RMS, and will usually be a few dB lower than the Total RMS reading. RMS can be viewed differently depending on what DAW you use, so if you’re unsure of the one you are using, try testing it out in another one. Most DAWs have trials where you can freely use all of the options for 15-30 days. 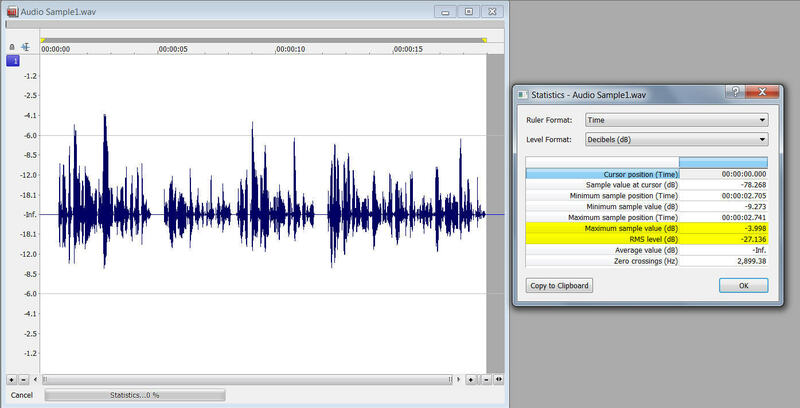 how do you measure audio between -23dB and -18dB RMS on a mac using grageband? I use Garage Band but master with a program called Twisted Wave- I think they have a free 30 day trial. Keep meaning to switch to Audacity but …. old dog…new tricks 🙂 Hope that helps! I am also having a difficult time with this. If I need to change the RMS levels, what’s the best way to go about that? I wouldn’t have to record it again…right?! The average of the RMS of the book I narrated is -21 dB, so I am wondering why the book was rejected. Please help!! Thanks for your time! I have asked this twice and they are literally worthless. I have been using Sound Studio 3 for my recording. It has the option of modifying the file to give the desired RMS. For each of my files, I set it for an RMS within the recommended range. And all of my files, according to your review, are below the required range. Any obvious explanation? Something that would be very helpful for me, and perhaps others, is if we could submit one chapter, or a small number of chapters, to see if they are satisfactory. As it is, I am spending three hours or so using Audacity to meet your requirements for about eighty files, and will spend another hour or so uploading them. It may turn out, as it did with Sound Studio 3, that I am doing something wrong, and have to do the whole job again. If I could just submit a few files that I thought I had fixed and find out if they were right, that would be a lot less work. Hi David! Contact support@acx.com with this request, and our agents can point you towards some resources that can help address your question.